Lightly toasted bread (baguette rounds, Uncle John’s Bread, Ciabatta, …whatever suits your taste). After trimming the stems off of the brussel sprouts, coarsely chop them. Blanch these in boiling water for about 3 minutes, and then drain. Put the sprouts in an ice bath. In a skillet, cook the onion in the butter, stirring occasionally. As the onion cooks, heat the olive oil in another skillet. When the onion starts to look translucent, add the smoked paprika, and stir. Once the paprika is added to your onions, remove sprouts from the ice bath and sauté in the olive oil. Keep both of these cooking for another five minutes. After five minutes, combine the onion and the sprouts in a mixing bowl. Arrange your bread on a baking sheet. 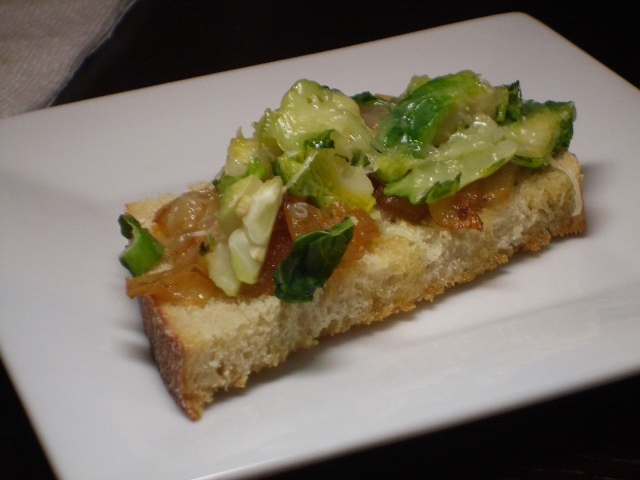 Spoon the sprouts and onion over each piece of bread. Add the shredded cheese to each piece and crack fresh sea salt and pepper over them. Bake for 4-5 minutes, or until the cheese has melted. Serve and ENJOY!